MathJax uses JS to display mathematical equations originally written in Latex Format. I use JotForm to Create Quiz and Online Assessments for students. Displaying math this way is integral part. I tried doing this using the source code option provided by Jotform. But I could not do it successfully. I have very limited understanding of programming, but given a direction, I would like to put efforts to make this work. Can someone plesase tell me how do I do it? I have already tried searching forum (and some self-testing) but so far I have not been able to come up with a result. This time, I went through the Source Code more thoroughly. This is what I have noticed. "\" (Back Slashes) are automatically getting removed and some other symbols are being replaced by & automatically. If that is what is causing MathJax's Engine not to recognize the Latex Text, then how can I solve it? This is just the first time I've heard about mathjax. I tried using it using a form source and load the mathjax script through CDN and did add some script from mathjax for testing and it was able to interpret the syntaxt but the downside is that once the form is submitted the equation is not being recognize yet. Let me submit a feature request and hopefully this nice feature will be added and part of the Jotform's calculation widget. I've added a widget request about MathJax. We have now hired a developer just to build widgets so I expect widget requests to be implemented much more quickly from now on. This was very Quick. I am very happy. Thank you very much. I have a some information and a Request. MathML and Latex are two very standard and Popular way to display Maths in Books, Journals, Web, Programs, etc. MathJax came up with a JS Display engine that does a pretty Great Job of correctly rendering mathematical equations. And the way to use it is a call to MathJax JS on every page that has math equations. Underlying it still is latex. So I believe the call was only made on the page displaying the form. Not on the thank you or the submission page. I absolutely love what you did there. For the moment, if I am able to display the equations in the form properly, I am, like, 80% done. I believe, I can take care of the rest offline. Can you please tell me how you did it? 1. (Might sound unusual) I had not expected that I would get a reply for such a small thing from you, much less such an update. I came to know you are the founder of JotForm from a medium post that I read - the one which you wrote about how you built a community for your product. Thank you very much for such a wonderful service. 2. Yes, I did check the Math Formulas, I would have gone with it, but I can't seem to be able to copy paste equations to and from latex. 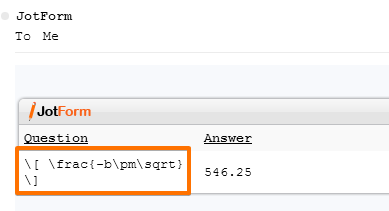 I have to manually type the formulas. It is very intuitive but not efficient. Mr. Aytekin will respond as soon as he is available. The ticket for the widget has been created, and this thread will be updated following implementation. 2. Save the form and get the source code using this linked guide. Please read the documentation that explains this here. 4. Put in the LaTEX or TEX math expressions where you need them inside paragraph tags <p></p> on the source code of the form you created. Did that help? Please let us know. It looks like we already have a MathJax widget. Sorry, I wasn't aware of it so I did not mention it in my post. Can you try it and send us feedback about it? The developer who is working on this widget said he implemented it for a user a few weeks ago and he was improving it with feedback from that user, but he was still waiting for some more feedback. So, it might still be little rough/undocumented. But, if you find any problems we can fix it. 1. I am glad you liked my blog post on Medium. 2. MathJax widget might be the solution. Hope it helps.